NORCO (6-2 overall, 2-1 Big VIII League) decided it was better to walk away trailing 28-0 in the second quarter to Corona Centennial last week than it was to play the rest of the game. Now sure, a lightning storm is nothing to joke about but the Cougars could’ve come back and played Saturday or Monday like everyone else. Instead, it’s just the game they walked away from. Coach Chuck Chastain told us a couple of weeks ago that he was looking forward to the game. Wonder what he’ll think about the decision when he looks back in 10 years time. 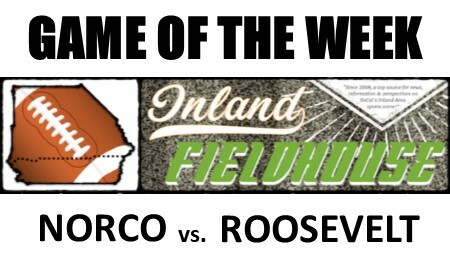 ROOSEVELT (5-3 overall, 2-1 Big VIII League) missed an opportunity to lock up at least third place in league after a 21-20 loss to Corona Santiago in Week 8. Roosevelt led, 17-7, when the game was halted in the third quarter but managed only a field goal when the two teams picked it back up on Saturday morning. The Mustangs need to win tonight or they’ll end the regular season with three consecutive losses. Norco is more talented but Roosevelt might be feeling desperate.